QUEENSBOUND is a collaborative audio project curated by KC Trommer and supported by a New Work grant from the Queens Council on the Arts. From Long Island City all the way to Jamaica, the poems of QUEENSBOUND map the neighborhoods and the vibrancy and diversity of the borough, embedding audio recordings from leading Queens poets and writers on a subway map, designed by Kyle Richard. Technical support for QUEENSBOUND was provided by Maham Faisal Khan. On November 3, 2018, the QUEENSBOUND project launched with a reading on the 7 line and reception at the Queens Museum. Some of the leading writers and poets of Queens, including Rosebud Ben-Oni, Malcolm Chang, Catherine Fletcher, Sherese Francis, Jared Harél, Nicole Haroutunian, Abeer Hoque, Safia Jama, Paolo Javier, Joseph O. Legaspi, Ananda Lima, Maria Lisella, Vikas K. Menon, Belal Mobarak, Meera Nair, Maria Terrone, and curator and host KC Trommer, read original work on the 7 train, beginning at Vernon Blvd Jackson Av stop, before stepping off at Mets-Willets Point and heading over to The Queens Museum for a reception. The event concluded with a song which included lines from every poem in the launch from Adam DeGraff and Tyler Burba, hosts of the reading series Kith & Kin. Read the story in Literary Hub and listen to the poems by clicking on the Queensbound map. If you are planning a trip to Manhattan, schedule a visit to the Transit Museum at Grand Central Terminal to see Poetry in Motion at 25. 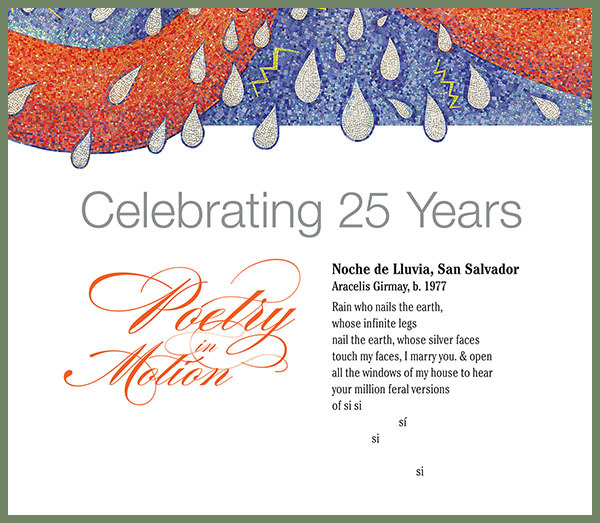 The exhibit celebrates 25 years of poetry displayed on subways and buses and features a broad range of the original Poetry in Motion car cards that have appeared in the New York City Transit system. See it by October 28, 2018. More about Poetry in Motion here. Yesterday, we mentioned the new installation of poems on buses and bus shelters in Olympia, Washington. In a followup to one of the nation’s most venerable transit-poem projects, Poetry in Motion on New York’s subways, here is a 16-minute WNYC link to an interview with Alice Quinn, the executive director of the Poetry Society of America and editor of The Best of Poetry in Motion: Celebrating Twenty-Five Years on Subways and Buses. In the interview, Quinn talks with Mary Harris about the origins and challenges of the program, hears from callers, and reads selected poems from the collection. Jack Cheng is a writer, designer and entrepreneur in Brooklyn. He creates found poems, which he calls Subway Cento, from ads in New York’s subways. According to Poets.org, “From the Latin word for ‘patchwork,’ the cento (or collage poem) is a poetic form made up of lines from poems by other poets.” While Cheng’s creations don’t use other poems as their source, they find poetic sense and image in materials that might otherwise be overlooked. See other examples of Subway Cento and find out more about Jack Cheng on his website, or view his successful Kickstarter novel-writing campaign. You can also have a look at previous posts tagged found poetry.